An ancestor to the English Bulldog, the French Bulldog goes back in history to 1860. Evidently, great numbers of these dogs were sent from England to France and then crossed with a variety of breeds to come up with the French Bulldog. French Bulldogs were so popular in the early 20th century they came in many different decorative forms as well. Some of the different varieties included music boxes, inkwells, chalkware and porcelain figurines and even Bulldog cuckoo clocks! But nothing in my opinion comes close to the French Bulldog growler. 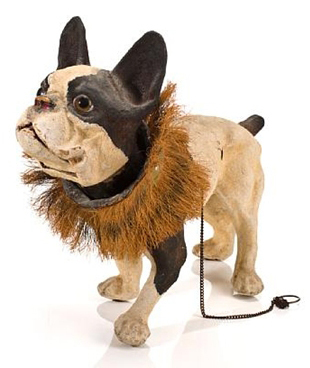 This friendly growling toy dog was created in France in homage to their native breed, the French Bulldog in the 1890’s. Modeled in Papier Mache they were typically life size in stature, with glass eyes, nodding head, articulated jaw and casters below their feet. Pull on the “leash” and he bares his teeth and growls. The large ‘Badger hair’ collar on the toy dog actually simulated the original straw collars worn by French Bull Dogs to protect them from getting their heads stuck in a Badger hole! These Papier Mache Growlers sell at retail in the range of $2,500.00 – $5,000.00 depending on rarity and condition. Looking for a discounted doggie? Try an auction house. A Bull Dog of fine pedigree recently sold at Morphy Auctions in Denver, PA for $1,035.00.